We have been big fans of the rapid progress Skechers Performance has made in the last three or so years. They have been relentless in delivering ever lighter, livelier shoes topped with modern uppers and all at very reasonable prices. In what is now an annual tradition towards significantly lighter and ever more fun to run shoes, Skechers showed us the GO Run Razor 3 Hyper, a 6.4 oz 23mm heel/19mm forefoot (without 3mm flat sock liner), 4mm drop trainer/marathon racer. I will retail, when it comes to market in November during marathon season, at $125. Catch that weight and price? 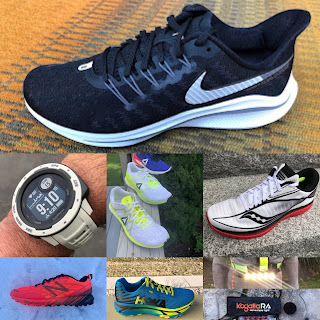 Shoe geeks may recall the Razor 2 (RTR review) weighed 6.8 oz and had a stack of about 18mm heel/14 mm forefoot (without sock liner) and was a fairly firm dynamic, light trainer racer. The Razor 3 will really up the comfort game for longer hauls than the Razor 2 could handle for many runners. It will be shoe for a wider range of runner types, paces, and distances than its predecessor, we think sitting between the current Ride 7 and Razor 2 . So how did Skechers add 5mm of cushioning front and back, provide plenty of outsole rubber, outfit it with a durable, light weight nylon mesh upper with 3D printed overlays, reduce the weight almost half an ounce, and deliver a soft well cushioned yet dynamic ride? A big part of the answer is a new midsole foam called Hyper Burst. It is not conventionally injection molded and is 15% lighter and 30% more resilient than their current mighty fine UltraFlight which succeeded FlightGen in current models reducing weight across the board. We can't get into more details but the innovative process plays a big role in delivering the weight and resiliency benefits. The resilience, other characteristics of this foam, good outsole coverage and Skechers testing indicates that despite the very light weight it should deliver the miles expected of a trainer. We have run in prototype shoes with Hyper Burst and the ride is silky smooth, soft, dynamic and almost weightless feeling for all the cushion. Fans of the Razor 2's firmer more conventional racer ride not to worry, Skechers has other goodies coming down the pipeline which will keep you smiling and fast. The Razor 3 looks like a promising shoe. But the looks are loud and cheap looking. I've purchased Skechers before but would probably skip this one based on looks. Please ask Skechers to clean up the looks - something like the Razor 2 looked much cleaner. 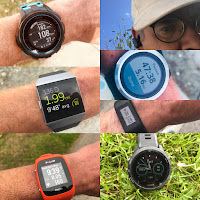 HI Anonymous 1, Agree Skechers on the move and fast with constant improvements in materials and construction all leading to lighter weights and more fun runs. Hi Anonymous 2, you are not the first to comment about the look, definitely different from the recent Skechers and reminds me of Hoka a few years ago. I have mentioned to Skechers that some are questioning the look and I know Skechers is following comments closely. This said I encourage you to not " judge a book by its cover" as the saying goes and wait for our review and others before making a final decision. Under the hood real good stuff here! I did not get a full spec sheet but will find out on drop with or without sockliner. Concur with the looks, really terrible. Have Skechers on my radar and can overlook 'the look' but jeese put some thought into an integrated design. I've got a couple hundred miles and 1 marathon in the GoRunRide7 as my first experience with Skechers performance. Great shoe! Bought another pair for an upcoming BQ attempt, but have been searching for a lighter, faster version. This may be it! Any concrete release date on these yet? I thought I saw Meb wearing these at the 2018 Bix 7 in Davenport this year? Looking forward to giving these a go. based on your recommendation, i have bought the gorun ride 7, and quickly eat 40km within a week in that shoe exclusively. I am in love with the flightgen midsole and forgot that I initially wanted to use it for rotation with my adidas boston 6.
if this hyperburst is claimed to be better than the flightgen, i can't even imagine. I met one of the designers at the NYC Marathon Expo. They are definitely trying to beat Hoka at it's own game. There is definitely a similar rocker geometry and the 4mm drop is also no coincidence. However, there is a lot more flex in the midsole than a Hoka which I found leads to a nice transition and more snap. This could well become my 10k race shoe and maybe my half race shoe. However, despite it having enough cushion to be a daily trainer, I wouldn't put it in that category. I don't think it's going to last much more than 200 miles. The rubber is pretty thin with a tread that looks like it could wear smooth pretty quickly so not sure how this will stack up on a wet surface. I was shown a cut away of the midsole. Definitely similar to pool noodle but apparently the holes are all CO2 filled. We will see whether it holds up better than standard EVA - they say it won't degrade as quickly. So, I bought it but I would say that it's not great value for money unlike most Skechers. $130 isn't cheap for a race day shoe. Where can I buy the shoes online? I am living in Europe and it is not available here I think. Skechers is out of stock on their site for the MaxRoad ultra 3(I preferred the previous version). Any idea of a next version of this shoe is coming out or any info about it? Ive heard that Skechers will be releasing other shoes with the hyperburst in 2019. Is this true? If so which ones can we expect to have the hyperburst update? I think we can expect all 2019 Skechers performance run models to have Hyper Burst midsoles although as of now can say when for each. The Go Run 7 Hyper definitely has it, and according to Runner's World it should be available around 2/1. There's also a Go Run Ride 7 Ultra that's been mentioned, but I don't know any details on that shoe other than its name. Hopefully there will be news on that one soon! Hi! This may come across as a dumb question, but I can't find a specific answer on Google and it's bothering me! I bought a pair of Skechers GOMeb Razor 2s last summer, loved them as an uptempo shoe in my rotation, but like any runner I know it's only a matter of miles before they completely break down, so I was looking for the next/updated version. Which seems to be the GO Run Razor 3 Hyper? Is that the correct sequence? If so, why the transition from GoMeb to GO Run? Have the two lines just merged, or are they completely separate entities just both encompassing the 'Razor' name. Thank you for your time!